Tool Use in Wild Orang-utans Modifies Sound Production: A Functionally Deceptive Innovation? – Proc. R.Soc B. ≈ Comments Off on Tool Use in Wild Orang-utans Modifies Sound Production: A Functionally Deceptive Innovation? – Proc. R.Soc B.
Here’s the abstract of a paper which is freely available from the Royal Society, in which deceptive communication facilitated by tool use in Bornean orang-utans comes under the spotlight. The kiss-squeak may not be familiar to all, so here’s a link to a page at the University of Zurich where different types can be heard, whilst elsewhere on the same page, an entire repertoire of orang-utan calls is described. of Moreover, not only is this paper free, but according to the Royal Society’s Facebook page, by way of celebrating 350 years of publication, their entire digital archive of 65,000 papers is free to access until February 2010, details of which will appear later in this post. Culture has long been assumed to be uniquely human but recent studies, in particular on great apes, have suggested that cultures also occur in non-human primates. The most apparent cultural behaviours in great apes involve tools in the subsistence context where they are clearly functional to obtain valued food. On the other hand, tool-use to modify acoustic communication has been reported only once and its function has not been investigated. Thus, the question whether this is an adaptive behaviour remains open, even though evidence indicates that it is socially transmitted (i.e. cultural). Here we report on wild orang-utans using tools to modulate the maximum frequency of one of their sounds, the kiss squeak, emitted in distress. In this variant, orang-utans strip leaves off a twig and hold them to their mouth while producing a kiss squeak. Using leaves as a tool lowers the frequency of the call compared to a kiss squeak without leaves or with only a hand to the mouth. If the lowering of the maximum frequency functions in orang-utans as it does in other animals, two predictions follow: (i) kiss squeak frequency is related to body size and (ii) the use of leaves will occur in situations of most acute danger. Supporting these predictions, kiss squeaks without tools decreased with body size and kiss squeaks with leaves were only emitted by highly distressed individuals. Moreover, we found indications that the calls were under volitional control. This finding is significant for at least two reasons. First, although few animal species are known to deceptively lower the maximum frequency of their calls to exaggerate their perceived size to the listener (e.g. vocal tract elongation in male deer) it has never been reported that animals may use tools to achieve this, or that they are primates. Second, it shows that the orang-utan culture extends into the communicative domain, thus challenging the traditional assumption that primate calling behaviour is overall purely emotional. This pattern indicates that kiss squeaks with the hand and on leaves, i.e. with lower frequencies, were emitted in circumstances assumed to be more dangerous. 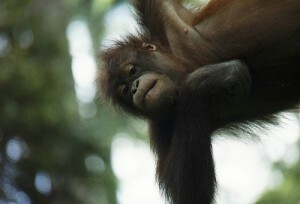 This functional use is plausible because orang-utans are arboreal apes living in dense forests, where visibility is usually poor and rarely sufficient to make accurate visual assessments of body size, particularly in disturbing encounters when orang-utans use displays and missiles towards potential predators. This way, the visual salience hypothesis (Peters 2001) for the function of the kiss-squeak forms also seems unlikely owing to poor visibility and because the dropping of leaves is not executed in isolation, but in combination with branch-shaking, breaking and throwing for example. Although one might argue that individuals of bigger body size classes (e.g. flanged males) would not deploy kiss squeaks with the hand and on leaves for the purpose of functional deception, this interpretation ignores that all individuals may benefit from appearing larger in highly disturbing contexts. Thus, it is reasonable to assume that kiss-squeak forms function to deceptively convey to the predator a larger body size. Indeed, as expected, orang-utans were never observed or reported to emit kiss squeaks with the hand and on leaves towards other orang-utans, since producer and receiver will generally be familiar with one another and/or with the deceptive technique. At the same time, low-sound frequencies travel farther than high-sound frequencies (Lameira & Wich 2008), and thus the use of hands and leaves during the production of kiss squeaks could be meant for the purpose of conspecifics’ recruitment. However, this is unlikely since recruitment of conspecifics via the emission of kiss-squeak forms, while not uncommon, usually takes much longer than the duration of an encounter (Van Noordwijk & Van Schaik 2009). The recent articles on Ardipithecus ramidus explained how the species lived in a wooded environment, and it would be interesting to know whether similar deceptions were used in that context as well, and/or whether their bipedalism evolved in part as a deterrent to the predatory instincts of those animals that hunted them. Between November 2009 and November 2010, the Royal Society will be celebrating its 350th anniversary, promoting a spirit of enquiry, excitement and engagement with science. To mark this special occasion, all our digital content, greater than 65000 articles including our entire archive dating back to 1665, is now FREE …TO ACCESS for three months, until 28 Feb 2010. Read articles by Newton, Hook, Boyle, Darwin, Watson and Crick, Stephen Hawking, Dorothy Hodgkin, Dirac, G. I. Taylor, Flemming, Captain James Cook and many many other eminent scientists. Enjoy all this via http://royalsocietypublishing.org – you lucky things! The Royal Society is planning further events to commemorate its founding in 1660, as can be seen from their dedicated web-page. Tool use in wild orang-utans modifies sound production: a functionally deceptive innovation? by Madeleine E. Hardus, Adriano R. Lameira, Carel P. Van Schaik and Serge A. Wich.